What is Christmas without a tree and some decorations all around the house? If only I had more money, I think I would spend millions on new ornaments every year... However, I think that I made a nice job with the help of my boyfriend last weekend...don't u think? Cosa è il Natale senza un albero e un pò di decorazioni in casa? Se solo avessi più soldi penso che spenderei milioni in decorazioni nuove ogni anno... In ogni caso, io ed il mio ragazzo abbiamo fatto un bel lavoro lo scorso fine settimana..non pensate? Gorgeous decoration ! Happy holidays , lovely ! Stupende queste foto! :) Ti auguro delle buone feste! Se ti va passa da me, mi farebbe molto piacere! $50 TJMAXX Gift Card Giveaway on the blog! Muy buen trabajo de Navidad hecho por los dos. Ma che carino siete stati bravi! ma che carino il taxi!! So, so pretty! Love the ornaments! great decorations :) Happy holidays ! Such a cute Christmas Tree! I've just finsihed mine but it's nothing like! Merry Christmas!!!! adoro i bastoncini di zucchero! anche io spenderei un casino di soldi in queste belle cosine! Che bello queste foto! Un bacio cara. Hello - yes it says I am following you when I click on gfc and you are in my reading list? Can you check again incase there was an error? Please let me know!! Che bel lavoro che avete fatto!!!!!! 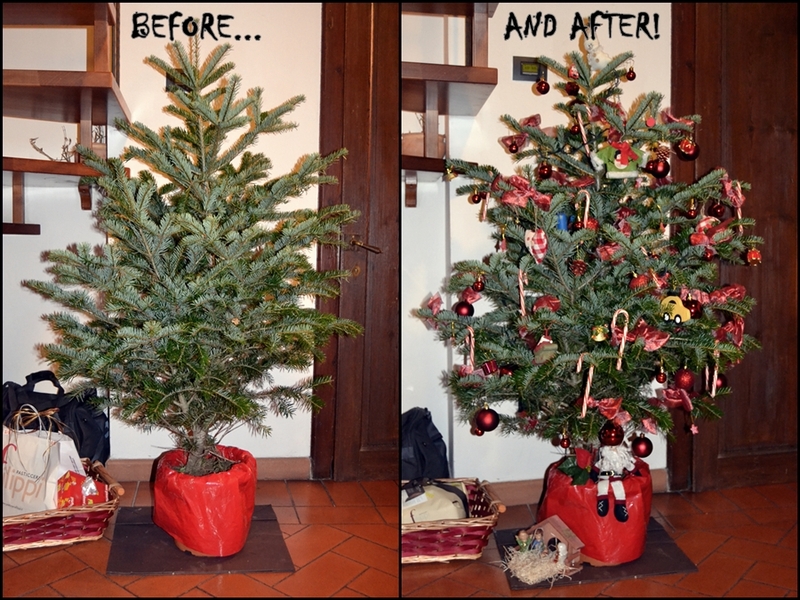 Molto carino questo albero!!! Wow, you decorate it so great! I really love it! Your decorations are so cute! Happiest Christmas! Great job on the decorating! The nice thing with decorating a Christmas tree is that there's no right or wrong. E' bellissimo il vostro albero!! thanks for the comment on my blog- i love your tree! and you look great you make me want to buy ugg boots! that most beautiful Christmas tree! That christmas tree is sooo cute! cute shots. have an awesome christmas day. Greetings from Germany. Hopefully the year 2012 was full of happiness and love. Wishing the year 2013 be better. Amazing pics! love that christmas tree! loving the holiday spirit around here! Wow, I love it!! I love christmas atmosphere!! your tree looks so pretty! Please let me know if you're looking for a article writer for your site. You have some really good articles and I believe I would be a good asset. If you ever want to take some of the load off, I'd love to write some material for your blog in exchange for a link back to mine. Hey, thanks for the lovely comment on our blog :) Sure we'd follow you. We've followed! Please follow back? yaay very pretty! well done!